Federal fisheries officials and the Center for Coastal Studies have spotted the first and second North Atlantic right whale calf and mother of the season in Cape Cod Bay. PROVINCETOWN - Federal fisheries officials and the Center for Coastal Studies over this past weekend spotted the first and second North Atlantic right whale calf and mother of the season in Cape Cod Bay. The Woods Hole-based Northeast Fisheries Science Center spotted the first pair on Saturday. An airplane survey team spotted the second pair on Sunday, according to a statement from the Center for Coastal Studies. The calf spotted Sunday, which was first sighted by Florida Fish and Wildlife Conservation Commission on Jan. 17 in the calving grounds of the southeastern U.S., was the third of seven known mother-calf pairs of the season. 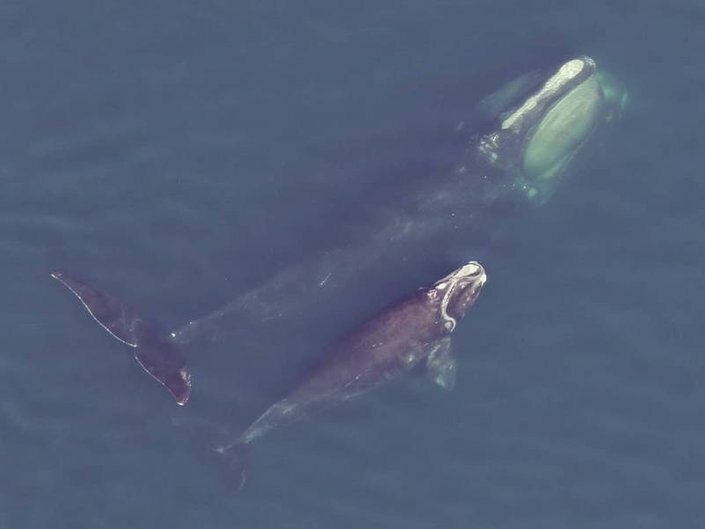 The calf spotted by the Center for Coastal Studies survey was born to a right whale known as No. 1204, an animal that is at least 38 years old and was first identified in 1982, the statement said. This is the mother whale’s ninth known calf, with her first documented in 1988 and the most recent one in 2013.